Alt text: I have this weird thing where if I don't drink enough water, I start feeling bad and then die of dehydration. That being said, "calories out" varies from person to person. I have one of those metabolisms where I get a strong reaction from eating anything containing rat poison, nuclear fuel rods, molten rock or mussels. Who ever came up with the idea that mussels are food? Last edited by Flumble on Mon Oct 10, 2016 3:58 pm UTC, edited 1 time in total. A less classy cartoon would say something about not digesting corn kernels and how they often come out the same as they come in. Actually about rat poison: rat poisons take advantage of the fact that rats cannot vomit. It's true. Therefore since you and your cat or dog certainly can and do vomit, rat poison isn't very dangerous. Of course, they can also digest things we wouldn't dream of eating. Flumble wrote: I have one of those metabolisms where I get a strong reaction from eating anything containing rat poison, nuclear fuel rods, molten rock or mussels. Who ever came up with the idea that mussels are edible? Actually, as omnivores, pretty much anything organic material is "edible". Whether it's "tasty" is mostly a cultural artifact. Nutritionists have pointed out that insects are not just edible, but highly nutritious. But we humans rarely eat them in any quantity. The explanation can't be their "edibility"; it has to be something else. Curiously, a lot of us do eat similar critters like shrimp and crayfish, so it's not their appearance. Again, the best explanation is that it's cultural. People in some societies reject shrimp with the same words that they use with insects; other societies (such as the US) use entirely different words to describe, say, locusts and crayfish, eating one but not the other. Bullets, my only weakness! How did you know? Cuvtixo wrote: A less classy cartoon would say something about not digesting corn kernels and how they often come out the same as they come in. Warfarin can be pretty dangerous for everyone. That certainly doesn't rely on being able to vomit or not. First coffee, then calories. What could possibly be on Randall's mind this month? Maybe he's just listening to Weird Al. Practically all his songs involve food or eating. jc wrote: People in some societies reject shrimp with the same words that they use with insects; other societies (such as the US) use entirely different words to describe, say, locusts and crayfish, eating one but not the other. And some people in societies such as the US reject shrimp etc by saying they won't eat anything that lives in the water. Others won't eat "anything with a face" which should make oysters and the like fair game and shrimp a borderline case, but there's substantial overlap with the "lives in the water" people. Wait, what? There are people who specifically won't eat things that live in the water? I can understand not eating animals, or not eating things with faces, or even not eating animals that live on land, or specific types of sea life, but why exclude all water life? Is it because of over-fishing? Because fishers almost always catch not-food things in their nets as well? Anything I can think of that one could object to eating seafood also applies on land (or has a parallel), so specifically boycotting water life just seems to be a way to have a label that isn't as common as vegetarian or whatever, or maybe to appear even MORE environmentally conscious than The People's United Front mere vegans. There are cultures where fishing is considered "lazy", as no husbandry is required. People are starving next to abundant seas because of pride. Whizbang wrote: Don't forget lobsters. Interesting. I've read a similar story involving potatoes. In France, at least, they were thought to be only fit for feeding to pigs until a certain doctor was fed them while a prisoner of war and found that they weren't half bad. Upon his release, he devoted his life to spreading the word about the incredible edible pomme de terre, which included posting armed guards by his potato patch and instructing them to accept bribes from anyone who wanted to steal his valuable produce. I think you are mixing up edible and palatable. There are lots non-edible organic material. Toxic plants. Poisonous mushrooms. You get the idea. Then there are the non-edible, non-toxic ones. Cellulose jumps to mind. And even the aforementioned whole corn. i.e. non-soluble fiber. The trick where his body converts cold iron to energy is particularly impressive. rmsgrey wrote: The trick where his body converts cold iron to energy is particularly impressive. What if all he'd ever want to eat is pizza? I have one of those metabolisms where I eat mcdonalds every day and don't care. heuristically_alone wrote: I have one of those metabolisms where I eat mcdonalds every day and don't care. So I can see where this is coming from. There's some utter crap that people come out with in relation to obesity, diet etc, a lot of which actually violates conservation of energy or mass or both. However, there is surely variation between individuals, beyond willpower and the ability to delay gratification. On the input side, some people eat more than others because their stomach doesn't signal fullness as soon, or because they enjoy food a bit more (because of a heightened sense of smell, perhaps). On the output side, some people can convert blood sugar into work more effectively, so their peak power output from exercise is greater, meaning they can burn more sugar/fat in a given gym session. Some people need to burn more "fuel" to maintain their body temperature, presumably owing to surface area/volume ratio. Also I understand that some people naturally make more micro-movements - fidgeting and jiggling - which burns calories constantly in the background. I'm one of the lucky ones: I do cycle quite a bit but I can eat whatever I like and stay skinny. I used to be pretty hard-line about the "eat less and do exercise" thing, and i still think it's the answer, but I recognise that it's easy for me to say. Stopping eating when there's food available and expending effort unnecessarily are not actions that evolution prepared us for. An interesting question is why some of us do find exercise enjoyable. The_Alchemist wrote: There are lots non-edible organic material. Toxic plants. Poisonous mushrooms. You get the idea. Isn't that category "edible, but only once"? Pretty much anything is only edible once. ... Sorry. Just blew a fuse. Some places my brain just won't allow me to go. The joke used to be "You don't need a parachute to skydive, you only need a parachute to skydive twice". But that's been well and truly busted in recent years thanks to Gary Connery and Luke Aikens. fit to be eaten (often used to contrast with unpalatable or poisonous examples). That is when I switch to KFC. Steve the Pocket wrote: I've read a similar story involving potatoes. Well, they will make you sick if you don't know which part to each. Romeo and Juliette killed themselves with a near relative of the potato. A dagger is a near relative of the potato?! Whoops, I guess I remembered that play wrong. I was thinking knight's bane. Both plants are members of the nightshade family and have toxins in their leaves. Whizbang wrote: Wait, what? There are people who specifically won't eat things that live in the water? . . . why exclude all water life? Having grown up near the Chesapeake Bay, I can speak to this. I've seen the Bay, smelled it, and washed it off after swimming in it, so I have little desire to eat anything that lived in it - especially filter feeders like oysters. Overfishing is part of the problem: if the Bay's oyster population were at capacity the entire volume of the Bay would be filtered by them three (3) times daily, and it would be crystal clear to the bottom even at its deepest points. I might be willing to eat an oyster raised in that environment. As it stands, we're lucky if the oysters cycle the bay's water once per year and turbidity is such that you can't see more than 6in deep in most places. I've gotten over my childhood fear of eating water pollution to some extent. I've learned to enjoy lobster, and I'm OK with assuming that most fish I eat are either farm raised or caught in open ocean. I still have trouble eating crab, though, and oysters are off my menu permanently. Unless I grow them myself and can vouch for the water quality they were raised in, bivalves of any kind are unlikely to enter my mouth. Quizatzhaderac wrote: Romeo and Juliette killed themselves with a near relative of the potato. To be fair, Romeo drank a poison to kill himself; it was Juliette who used Romeo's dagger to kill herself. I don't recall anything in the text indicating nightshade as the poison, just that it was illegal to sell and the apothecary had it on hand. orthogon wrote: I'm one of the lucky ones: I do cycle quite a bit but I can eat whatever I like and stay skinny. I used to be pretty hard-line about the "eat less and do exercise" thing, and i still think it's the answer, but I recognise that it's easy for me to say. Stopping eating when there's food available and expending effort unnecessarily are not actions that evolution prepared us for. An interesting question is why some of us do find exercise enjoyable. Because maintaining fitness can be (literally) a matter of life and death, so it's natural for staying in good condition to feel good. 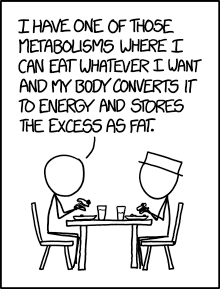 His body converts what he eats to energy? So he's a nuclear reactor?